Also war between Saudi Arabia and Iran has been predicted…. ???? ??? ???? ??????? ???? ????? ??? ???? ?????? ?? ?? ?? At the time, Al Jazeera reported that Yemen’s Houthi rebels claimed responsibility for the attack, saying they launched the Yemeni-made, long-range ballistic missile Burqan 2-H (with a range of 500 kilometers) from the Saudi-Yemeni border before being intercepted. But tonight, according to a statement from the Saudi coailition carried by the state-run Saudi Press Agency, the missile that targeted Riyadh has been called “a direct military aggresion” by Iran against Sauid Arabia, that “could rise to be considered an act of war.” Furthermore, the Saudi-led coalition has closed all Yemen’s land, sea and air ports after missile targeted Riyadh. Following on what the Coalition had previously announced regarding the ballistic missiles launched by the Iranian-controlled Houthi militias from within Yemeni territory that targeted the Kingdom of Saudi Arabia, the most recent of which was the flagrant military aggression by the Iranian-controlled Houthi militias which targeted the city of Riyadh on November 11, 2017 (Corresponding to 15/2/1439 Hijri) using a ballistic missile with a range of more than 900 Km. And, after the thorough examination of the debris of these missiles, including the missile launched on July 22, 2017 (Corresponding to 28/10/1438 Hijri) by experts in military technology, has confirmed the role of Iran’s regime in manufacturing these missiles and smuggling them to the Houthi militias in Yemen for the purpose of attacking the Kingdom, its people, and vital interests. The Coalition’s command considers the Iranian regime’s action in supplying the Houthi militias that it commands with these missiles to be a blatant violation of the United Nations Security Council (UNSC) Resolutions that prohibit nations from arming these militias, specifically UNSC Resolution (2216). Further, Iran’s role and its direct command of its Houthi proxy in this matter constitutes a clear act of aggression that targets neighboring countries, and threatens peace and security in the region and globally. Therefore, the Coalition’s Command considers this a blatant act of military aggression by the Iranian regime, and could rise to be considered as an act of war against the Kingdom of Saudi Arabia, and thus affirms the legitimate right of the Kingdom to defend its territory and people in accordance with Article (51) of the U.N. Charter. The Coalition Command also affirms that the Kingdom reserves its right to respond to Iran in the appropriate time and manner, in accordance with international law and based upon the right of self-defense, including the defense of its territory, its people, and its vital interests, which is enshrined in international agreements and conventions including the UN Charter. The Coalition Command calls upon the international community and the United Nations Security Council including the sanctions committee established by the Council for the implementation of UNSC Resolution 2216, to take all necessary legal measures to hold Iran accountable for its violation of UN Security Council Resolutions, primarily resolution 2216, in addition to its violations of provisions and principles of international law that criminalize the aggression against other states, due to: Iran’s direct involvement in the unlawful smuggling of weapons to the Houthi Militia under its control, which threatens international peace and security; its aggression against the territory and people of Saudi Arabia and other neighboring countries; and its continued support for the Houthi militia in violation of international resolutions that aim to restore legitimacy in Yemen. What better way to get the price of oil up before an Aramco IPO – which President Trump just happened to mention out of the blue. 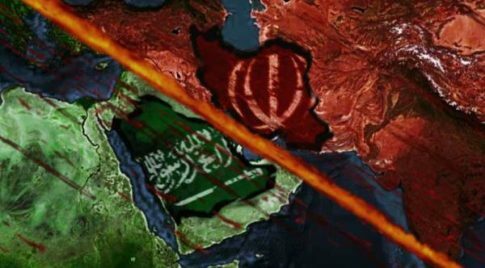 And amid increasing evidence of Saudi rapprochement with Russia and China – and the growing de-dollarization of the anti-unipolar world – a Saudi war with Iran would require the latter to be supported by Washington to survive… which perhaps could be quid pro quo for ending any chatter about the death of the petrodollar. OK so the Iranians sold missiles to the Houthis in Yemen. Is that any worse than the Yanks + Saudis + israelis giving guns, missiles, training and funding to the mercenaries who invaded Syria, or rven Iraq?